This means that computers could have the benefits of data delivered by light – high speeds, no heat caused by electronic resistance, and no interference from electromagnetic radiation – but would also be able to slow that data down enough so that computers chips could do something useful with it. “For [light-based computers] to become a commercial reality, photonic data on the chip needs to be slowed down so that they can be processed, routed, stored and accessed,” said one of the research team, Moritz Merklein. “This is an important step forward in the field of optical information processing as this concept fulfils all requirements for current and future generation optical communication systems,” added team member Benjamin Eggleton. The team did this by developing a memory system that accurately transfers between light and sound waves on a photonic microchip – the kind of chip that will be used in light-based computers. First, photonic information enters the chip as a pulse of light (yellow), where it interacts with a ‘write’ pulse (blue), producing an acoustic wave that stores the data. Another pulse of light, called the ‘read’ pulse (blue), then accesses this sound data and transmits as light once more (yellow). 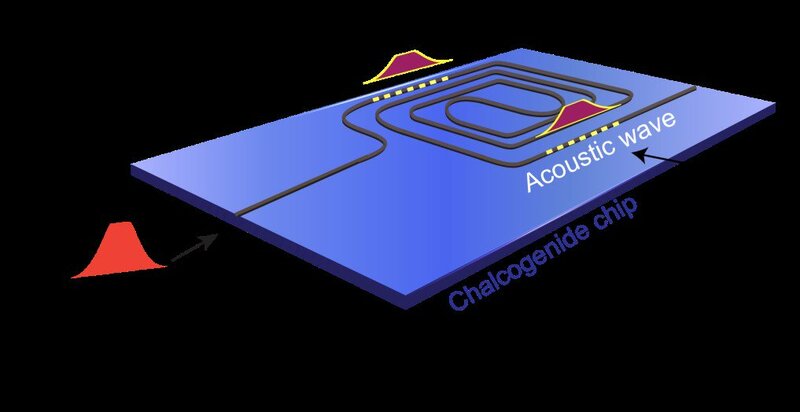 While unimpeded light will pass through the chip in 2 to 3 nanoseconds, once stored as a sound wave, information can remain on the chip for up to 10 nanoseconds, long enough for it to be retrieved and processed. The fact that the team were able to convert the light into sound waves not only slowed it down, but also made data retrieval more accurate. And, unlike previous attempts, the system worked across a broad bandwidth. “Building an acoustic buffer inside a chip improves our ability to control information by several orders of magnitude,” said Merklein. “Our system is not limited to a narrow bandwidth. So unlike previous systems this allows us to store and retrieve information at multiple wavelengths simultaneously, vastly increasing the efficiency of the device,” added Stiller. The research has been published in Nature Communications. This entry was posted in Technology & Science and tagged light, sound, Stored. Bookmark the permalink.